Janie's Pocono Mountain Garden: Audrey III, My Oriental Poppy...Or Is It? Audrey III, My Oriental Poppy...Or Is It? If you've ever seen the 1986 movie Little Shop Of Horrors, you probably know who Audrey II is. 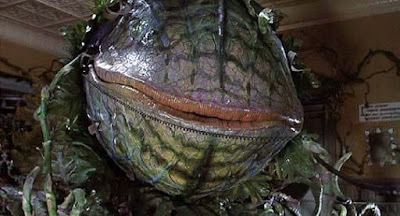 which I call, Audrey III. 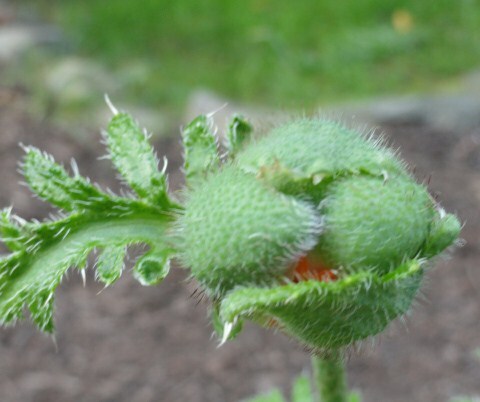 Is this truly a flower bud, or is it another alien plant from Outer Space masquerading as an Oriental poppy? I first noticed this bud forming on August 4th. Oriental poppies usually bloom in May or June and have long bit the dust by August. Should I be worried? A little larger now on August 10th. Hmm ... a spot of reddish -orange is peeking through on August 12th. Did that growing red bud just turn its head on August 16th? August 17th. Oh my, it's breaking through. My Audrey II appears to be a fully formed Oriental poppy ... or is it?